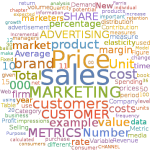 I thought it’d be helpful to share a couple of word clouds that summarize marketing. The first is based upon the Wikipedia page on Marketing. While Wikipedia is frowned upon by many scholars I think it is very informative. Clearly everything on Wikipedia isn’t necessarily “true” but if you believe in the Wisdom of Crowds — and I think it applies reasonably often — then Wikipedia probably isn’t too far off accuracy. Wikipedia is also very useful for understanding consensus definitions. 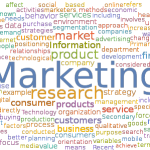 As marketing academics we can define marketing all we like but what do “normal” people generally think marketing involves. The word cloud of the Wikipedia marketing page helps illustrate this. It is very easy to do using the WikipediaData command in Mathematica — to be honest I was stunned and very impressed how easy it was (see Joyce 2015). Below is the result; unsurprisingly Marketing dominates but research also features quite heavily. Sales and Price seem to be as important as marketing plus customer and customers are critical. There is a decent amount of overlap with the Wikipedia wordcloud. It might not be the most surprising thing in the world but at least our book seems to fit well with what people think of as marketing. Read: Alan Joyce (2015) New in the Wolfram Language: WikipediaData, March 20, 2015, http://blog.wolfram.com/2015/03/20/new-in-the-wolfram-language-wikipediadata/ for more on the WikipediaData function in Mathematica.